Put the chicken pieces into a dish. Pour mixture of beef broth, soy sauce and ginger over the chicken. Refrigerate and let chicken marinate in the mixture for 1-3 hours. Preheat oven to 350 degrees. Drain and discard marinade. Transfer chicken to a baking dish that has been sprayed with nonstick cooking spray. Put dollops of BBQ sauce over the chicken breasts and spread with the back of a spoon to make coverage even. Bake for 20-40 minutes or until chicken is no longer pink. 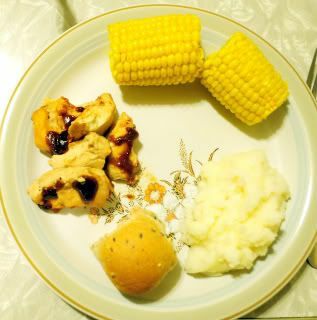 I served this with corn on the cob, mashed potatoes and wheat rolls. Preheat oven to 350. Core each apple (make sure to get the entire core and all seeds out, but be careful not to poke through the bottom of the apples.) Place into a baking dish. In a separate small bowl mix together raisins, brown sugar and walnuts. 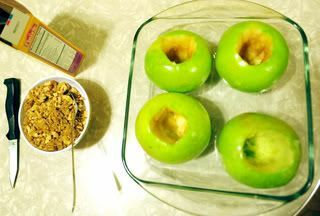 Spoon the mixture into each apple. 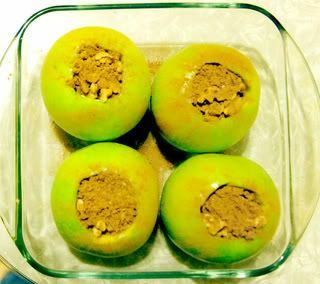 Sprinkle cinnamon and nutmeg over the top of each apple. Put about 1/2 inch of water into the bottom of the dish. 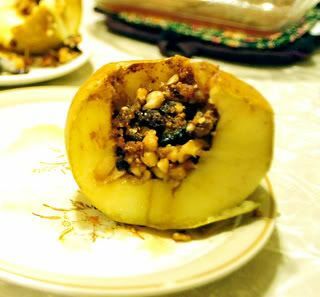 Bake apples between 20-30 minutes, until fork soft. Serve and enjoy! I wonder if I could exchange oats for the nuts??? The apple looks wonderful. Think I will try that out this week. Thanks!